HomeRetaining walls made out of a Terramesh and gabion combination system save the day! Retaining walls made out of a Terramesh and gabion combination system save the day! A project in Jambi, Sumatra made use of a Terramesh and gabion retaining wall to mitigate landslide risk. The Public Works Department chose to collaborate with Maccaferri Indonesia to build a gabion and Terramesh System retaining wall. The installation is designed to mitigate landslide risks. Maccaferri renowned Terramesh System is a modular system used to form rock faced reinforced soil walls (also known as Mechanically Stabilised Earth) and embankments. On taller slopes and structures, it can also be used in conjunction with our high-performance primary geogrids, ParaLink, ParaGrid and MacGrid WG. 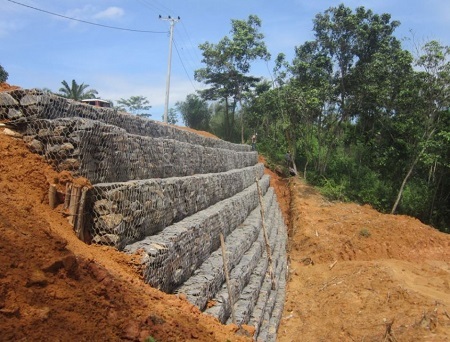 A recent landslide risk mitigation project in Jambi, Sumatra shows how Terramesh and gabion combination systems can be used to retain slopes in tropical environments. A landslide occurred along the National Road in Jambi due to the heavy rainfalls. The area affected by the landslide is approximately 8 m high and 30 m wide. According to Cone Penetration Test data, the foundation soil is sandy clay measuring up to 3 m in depth. The foundation soil condition has been worsened due to the high water content. The Public Works Department decided to build a reinforced soil wall as a retaining structure using Maccaferri’s modular and flexible Terramesh System. Prior to carrying out the installation of Terramesh, the contractor stripped 0.5 m of topsoil away and then installed timber piles with a diameter of 12 cm and a length of 4 m. The spacing of the wooden piles equalled 1 m. Timber driven mini-piles are a common method used in Indonesia to transfer the load to a deeper and suitable stable foundation soil. The selected tail length of the Terramesh System is equal to 4 m. The gabion elements placed at the bottom of the structure have a dual function and work both as a drainage system and pile capping. Static and seismic analysis was carried out to check global stability, internal stability and stability as retaining wall (sliding, overturning and bearing capacity). The project concluded in May 2016. For more technical information, please download our case history. For more general information, please contact us.